ownCloud e Collabora annunciano l'immediata disponibilità di LibreOffice online per ownCloud Enterprise che ora si arricchisce della possibilità di editare online i principali formati di documenti di testo, fogli di calcolo e presentazioni. Gli utenti aziendali che si affidano a ownCloud Enterprise potranno ora collaborare più facilmente grazie alla possibilità di editing condiviso; qualsiasi utente potrà modificare i documenti e gli altri potranno vederne in tempo reale i cambiamenti. 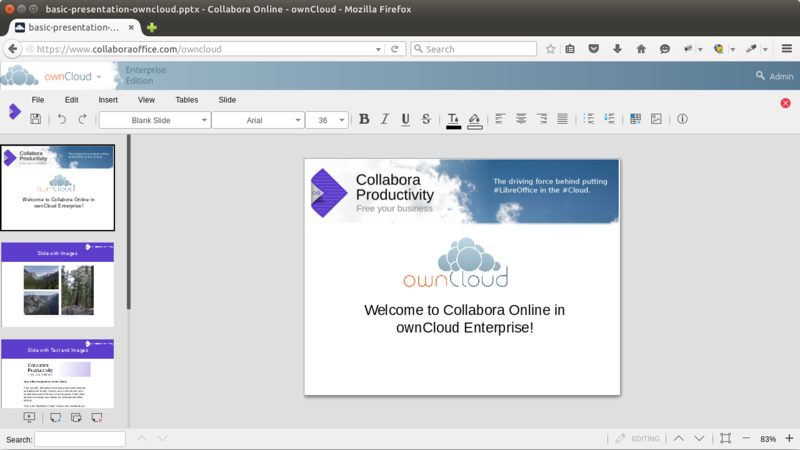 Collabora Online for ownCloud Enterprise immediately available, providing online editing functions for text documents, spreadsheets and presentations inside ownCloud for improved collaboration. Collabora Productivity, the driving force behind putting LibreOffice in the Cloud, and ownCloud, the company behind the world’s most popular Open Source enterprise file sync and share (EFSS) software are proud to releasea combined commercial solution including Collabora Online, which brings the first-ever production ready LibreOffice Online functionality to the public. 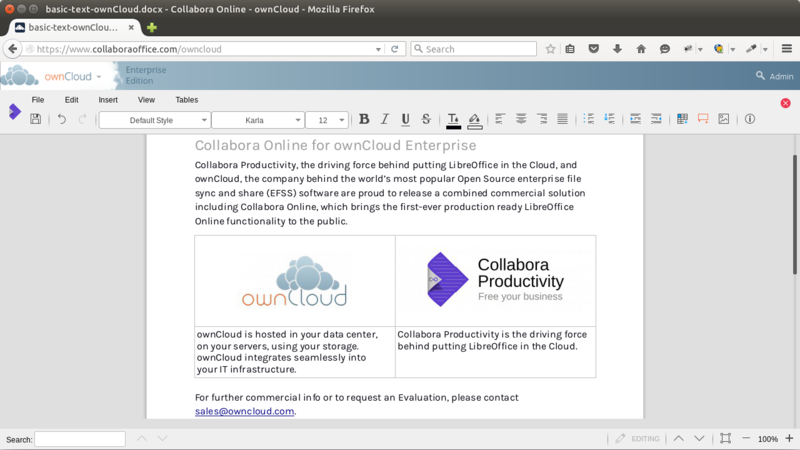 Collabora Online is a key building block for ownCloud, providing Enterprise users with the much requestedOpen Source cloud document suite that supports all major document, spreadsheet and presentation file formats, increasing productivity while staying in full control of sensitive corporate data. Teams are able to collaborate using “shared editing” where any one user can edit and all other users can see changes in real-time. For existing ownCloud users this resolves potential version conflicts. While working independently on the same document, this collaboration now happens online, inside the ownCloud web frontend. This solution is now available from ownCloud under the name “Collabora Online for ownCloud Enterprise”. Pricing starts at 1000 EUR or 1200 USD for 50 users per year in addition to an ownCloud Enterprise or ownCloud Standard Subscription. For further commercial info or to request an Evaluation, please contact sales@owncloud.com. 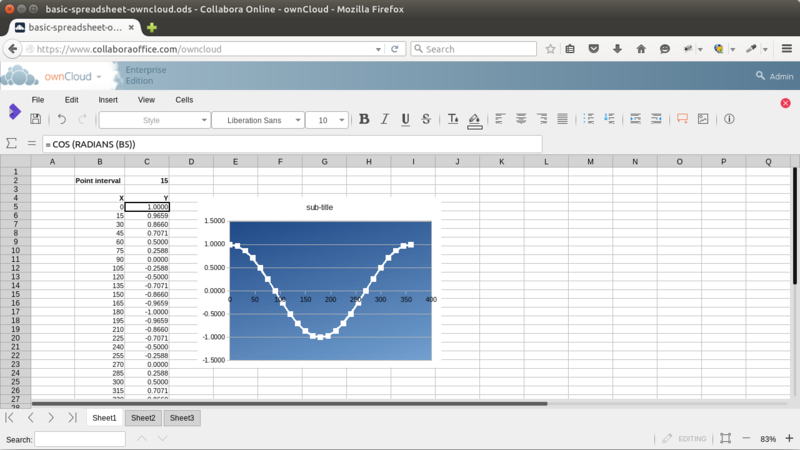 There is also anonline demo where you can try out Collabora Online in ownCloud at: www.collaboraoffice.com/owncloud.